What started as a $125.00 purchase of a small parcel of land at 15 grew and blossomed over the years into a multi million-dollar company, and with this, Herman Jerome Russell came to epitomize black entrepreneurship by becoming one of the first black millionaires. By the time of his retirement in 1997, Russell had built a conglomerate that included construction, property management, real estate development, airport concessions, and communications companies stretching across Alabama, Florida, Georgia, Louisiana, North Carolina, and Tennessee. Herman Russell was born in Atlanta, Georgia in 1930 and attended Tuskegee Institute where he majored in construction, graduating in 1953. In 1957, he took over the family business, Russell Plastering Company. Employed by his father since the age of 10, Russell was no stranger to hard work. The many years under his father’s tutelage encouraged his entrepreneur spirit and gave him the needed preparation to handle the family business. In 1963, Russell made history by becoming the first black member of the Atlanta Chamber of Commerce. He later became president of the Chamber. Russell also served as a board member of Central Atlanta Progress and the Atlanta branch of the National Association for the Advancement of Colored People (NAACP). 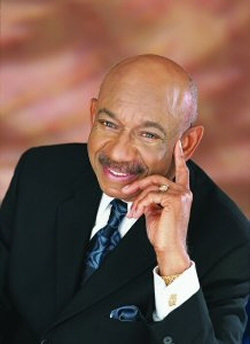 Herman Russell, who knew and supported the civil rights campaigns of Dr. Martin Luther King, Jr., was generous in philanthropy with gifts to Tuskegee Institute, Clark Atlanta University, Georgia State University, and Morehouse College. He has also received various awards highlighting his contributions to low income housing in the Atlanta area. At the time he took over his father’s business, the Russell Company operated a $15,000 a year business. At the time of his retirement, his businesses were bringing in well over $150 million annually. Among his construction projects were the Equitable Life Assurance Building, Georgia Pacific Corporation Office Tower, the Georgia Dome, and the Coca Cola headquarters. His company, H.J. Russell & Company, is one of the biggest minority owned firms in the country. In 1992 Herman Russell became part owner of Atlanta Hawks basketball team.